~Jo's Scrap Shack~: Fun Friday with Little Blue Button Stamps! 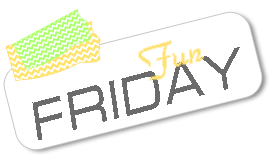 Fun Friday with Little Blue Button Stamps! Wait until you all see the gorgeous stamps that are here for this release! ADORABLE! You really do have to check out February's new release. Again, there is something there for everyone! 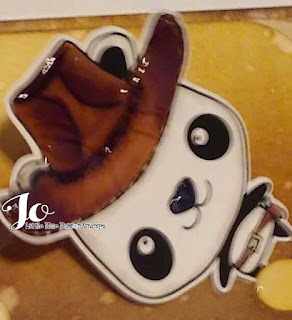 And I couldn't wait to work with this sweet image, Cowboy Panda. 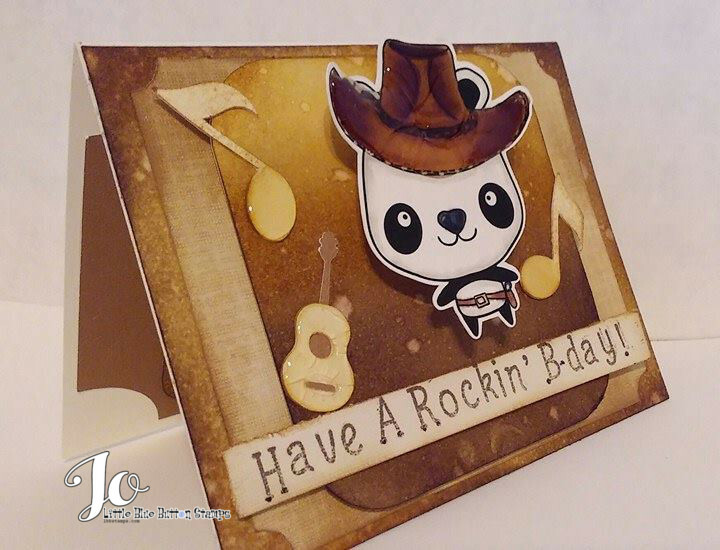 Ok when I first saw this adorable Panda with his cowboy hat on, I immediately knew I wanted to make a very masculine card and my inspiration all came from his little cowboy hat. I lived in Texas for a few years awhile back and all I can remember is the look and smell of worn leather. So when I saw this adorable image, I knew I wanted my card to look rugged, masculine and resemble old, torn leather. I am very pleased with how this turned out! 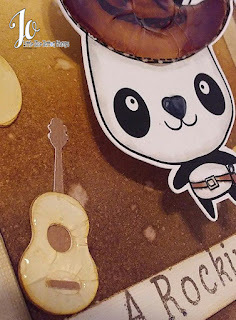 My panda was colored in using copics and I used some crackle glaze on his hat to try and mimic the look of an old worn leather hat with creases. In some spots you can really see the effect but overall it is nice and shiny and adds texture. I took some Canson 140lb watercolor paper and took some brushed corduroy & ground espresso distress inks and started to blend the colors to make my background. I cut out a rounded edged shape from my Scan N Cut and inked that up as well to match the background. Took some water and spritzed both and used a paper towel to dab it. Love how this looks so much like worn leather. Since I had my Scan N Cut out already, I cut out my little panda and decided to cut out a little guitar and some music notes. After-all, cowboys love their guitars! I distressed the edges of the guitar and music notes and then added some regular glossy accents to the bottom of the music notes and some crackle glaze to the guitar. Love it! To finish up the card, I took a strip of paper, distressed the edges and using Lawn Fawn's "Claire's ABCs", I created my own sentiment. Added a little glossy accents to his nose and my little cowboy is on an action wobble!!! Well that is it! I hope you like him! Remember to subscribe to the LBBS Store because shop subscribers get 25% off all new release items!!! To take advantage of this amazing discount, just use the code: "New25" in your shopping cart! 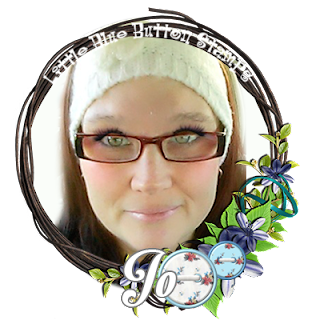 Please make sure to stop by the Little Blue Button Stamps Blog to see what my design team sisters have created for you and to see the other new digital stamps from February's new release. If you want to purchase "Cowboy Panda" or any other stamp you may have been eyeing up, just go visit the LBBS Store. Thank you so much for stopping by today and have a great weekend!!! Wonderful card. Love this cute panda. This is darling! I love the faux leather technique and the touches of glaze! Thanks so much for stopping by the Gossamer Blue blog and for your sweet comments. I just love this card. Your blog is wonderful! Super adorable, love the colors and the wobble action. Thanks for joining my DL.ART THANKFUL THURSDAY CHALLENGE. Have a blessed day DIANA L.
This is just precious my friend! I absolutely adore the cute panda and his outfit! !I LOVE the cool background! Super fun card my friend! Awesome job! Oh my gosh, couldn't be cuter! 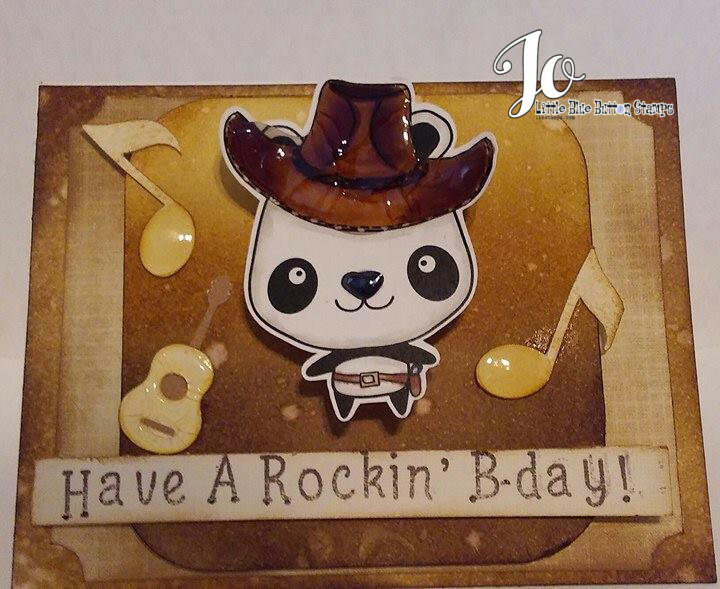 Fun background and sweet Panda!